I’m afraid my abbreviated version of this essay simply doesn’t do it justice. 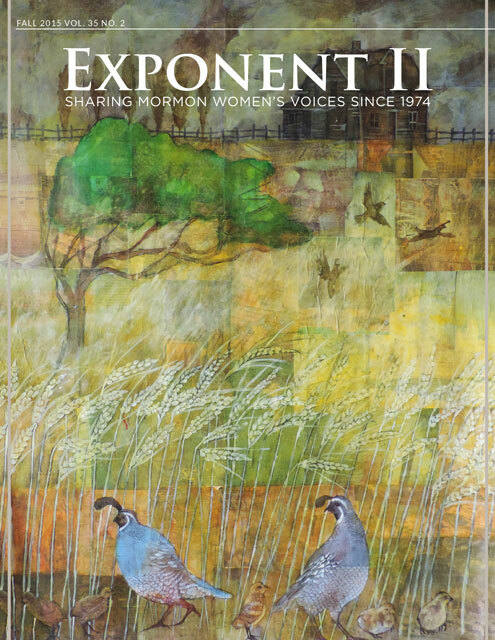 Please check out the complete version in our archived Exponent II articles. My husband, who is a youthful fifty-two, says it’s hard for him to relate to that old face that looks back at him from the mirror. I can empathize. My daughter, who hadn’t visited us for about six months, exclaimed when she first saw me recently, “Oh, you’ve frosted your hair!” I told her with a withering tone that it was all natural, and I must say, I enjoyed her discomfort. But choosing to age gracefully can easily be cancelled if I decide I don’t care for the particular grace that age has dealt me. Other choices or changes are not so readily overcome. So despite how much I might resist the uncomfortable realization, I probably am more at the point of having become. The older I get the more limited my possibilities appear to be. One choice precludes another, and soon a path has been set that I did not anticipate. And I know now, as I wish I’d known at the time, how much some careless decision might eventually effect me…. The danger in having almost become is that I might not recognize new direction that are open to me. If my inner age changes too radically with all this buffeting by reality, I might begin to think of myself as unchangeable, as too old or too comfortable the way I am. I want to always feel on the brink, to be ready at any moment to learn something new, to be flexible in mind and spirit as well as body. Otherwise, I might not be like me friend LaVerne who realized at seventy-eight that not only must she get a driver’s license but that she was also not too old to learn. She called up an instructor, arranged lessons, passed the test, and has been driving now for four years. True, she acted out of desperation when her sister, the driver in the family, developed Alzheimer’s disease, but much of my best learning has been in response to just that sort of desperation. And so, what is the answer? When people ask, I really do try to send them in the best direction, even though I sometimes resent being interrupted in my own struggle along difficult terrain. But I also try to be much more open about my unsureness and the details of my struggle. Even though it’s comfortable to think righteousness make life easy, all I can attest to is easier. Gone are the days when I pretended that life was a breeze and that going uphill was just as much fun as downhill. And I persist. One positive thing that age has given me is perspective; I know now that the times I most value in retrospect are those time when the struggle was toughest because that was when my learning was greatest. But I also don’t go out looking for trouble. The gospel gives me a picture to follow—even if it isn’t a well-defined road map—and I am grateful for those times when my choices seemed clearly inspired. I have felt the concern and enjoyed the involvement of many from both sides of the veil. I am also relieved that I have arrived at this point with only a few regrets. So look to me for direction at your own risk, but join me on the walk any time you’d like. Soon after writing this piece, my life fell apart. My sister, her husband, and two sons died in an automobile accident in Spanish Fork canyon. I suffered a nine-month illness that, when it was final diagnosed, led me to think briefly that my own death was imminent. This frustrating period was immediately followed by my husband’s diagnosis of cancer. His predicted six months blessedly stretched to eighteen. Just before his death, my nephew’s twenty-year-old bride died after a six-week bout with recurring cancer. After her four cancer-free years, we were totally unprepared. Interspersed in all this were biopsies and successful cancer operations of several other loved ones. Because I have now because that most dreaded of all things—a widow—I decided to see if this essay on my discomfort with having almost become still expresses my feelings. I laugh as I read of my desire to stay on the brink of possibility because I’m now perched uneasily on an abyss of confusion. Anything is possible except what I spent thirty years building. What were comfortable givens are now all open questions. Too much choice is hell. My life then seemed clearly mapped out compared to the uncharted territory opening up before me now. I find that I don’t delight in change quite as much as I indicated. I’ll probably always feel uncomfortable if I think someone is using me as a guide. Being responsible for my own actions consumes enough of my energy. But there’s a paradox here. Why write about it if I’m not willing to be judged? My husband hated bumper stickers and shirts that advertised. SO one Christmas I had a sweatshirts silk-screened for him, “I REFUSE TO FLAUNT MY OPINIONS,” followed by his signature. My point to him was that the refusal itself was an opinion. My point to myself is that teaching was the wrong career choice if I really didn’t want to be a model. I say that I don’t like being watched, and yet I put it out here for all to see. And so, what is the answer now? I certainly value the knowledge I’ve gained. Working so hard to be joyous has chipped away at my cynical shell and given me renewed innocence. Just learning to appreciate the intrinsic value of each moment of life has itself been a blessing. This path I’m on is one I would never have chosen, but nonetheless, I’m determine to make it a memorable journey. I get a funny kind of comfort standing in the cemetery looking at my name hammered deeply into that beautiful pink granite. Despite where this unexplored path might lead me, at least I know where I’m going to end up. On the last walk my husband felt strong enough to make, I put my hand in the center of his back to give him a boost up a particularly steep hill. He let me leave it there only for a moment; although the support felt good, he was afraid someone might see. But, hey! I’m not proud. Give me a push if you’re so inclined. I’d welcome the feel of your hand in the middle of my back. What I’m saying is that not only are you welcome to join me on the walk as I once said, but please come. The path seems less steep with a friend by my side. Thank you so much for posting this wonderful article. Strange to find someone wearing my same face giving name to my selfsame hopes and fears.